Are you searching for a deck construction company that you can trust with a project at your home in Edwardsville, IL? If so, contact the experts at Chesley Fence & Deck. Having served area homeowners for nearly 40 years, we are one of the most experienced and trusted deck building companies in the area. 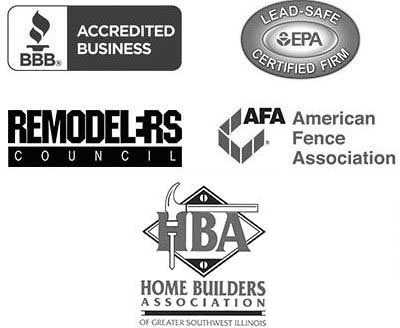 Simply look to our long list of satisfied customers and A+ rating with the Better Business Bureau as proof. Chesley Fence & Deck is proud to offer more decking options than most other deck construction companies in Edwardsville, IL, which makes it easy for our customers to select the product that best suits their preferences and budgets. If, for example, you’re looking for a beautiful and durable option that comes at a relatively low cost, our premium cedar may be best. This decking has a rich natural color and is more resistant to warping and cracking that many other types of wood. If you’re interested in learning more about the custom deck construction services we provide in Edwardsville, IL, contact Chesley Fence & Deck today.